I want to thank you for you're for the prompt response and service. Your professionalism, courtesy, and expertise are truly appreciated. The work you preformed at my house looks and work's excellent! Being in business myself for many years I value knowing I have qualified company in Elite Electric! 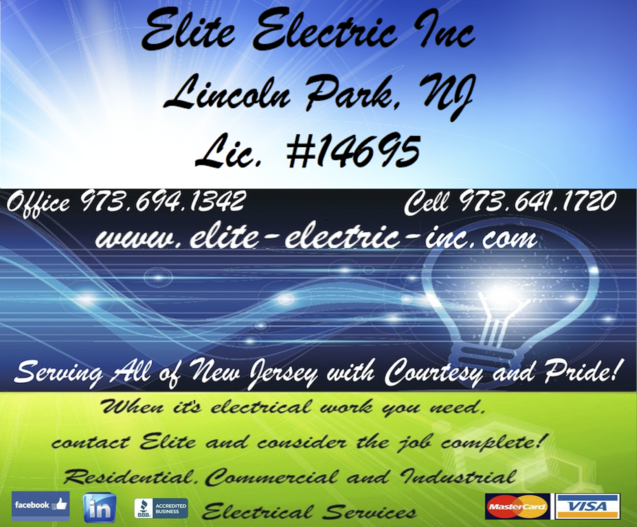 Elite Electric is more than just a highly qualified electrical company. They are meticulous professionals who makes a thorough assessment and plan of each job so that no detail is left out and the client can clearly see the complete picture before any commitment. James and his crew have performed a variety of extensive projects at three of my houses and has exceeded my expectations in all cases. If you want excellence, hire Elite Electric! It is always a pleasure working with Elite. They know the trade inside and out. Elite is always on time and ready to work when promised. I gladly recommend Elite to my customers. I have used Elite Electric for a number of jobs, some of significant complexity, and have always found them to be prompt, courteous and very competent. I would not hesitate to recommend them highly. Elite Electric is a wonderful company. My phone calls were returned right away and Elite was able to do the electrical work within a very reasonable period of time. I would use them again in a heartbeat! work in an orderly manner with an emphasis on neatness - NO mess! another professional such as structural problems. In summary, I will continue our relationship and highly recommend Elite!!! I have worked with Elite Electric on several jobs and I can attest to professionalism, timeliness (a real virtue in the world of contracting) and to the quality of work. James Halligan (Owner) is very involved in the entire project from the planning stage until completion of the project, and he actively makes valuable suggestions many of which enhance the project results. He is not the type of contractor who tries to cut corners or who attempts to do the least possible to get the job done. With Elite, when the job is completed, it is done right, on time and at a fair price. Elite Electric is awesome if you get the chance to get Elite as your electrician you will be thrilled at the incredible work that they do. They are detail oriented and do not cut any corners, you will say that they do work to their satisfaction, which is portrayed in everything that they do ...they have done a few things around my house and they have the midas touch cause every job done is worth its weight in gold. Bottom line there is no better in my opinion *************like I said they are AWESOME AND THE WORK SHOWS IT!